We set aside one day of our 8-day Tokyo trip, for Tokyo DisneySea! In California, there’s Disneyland and California Adventure next to each other. DisneySea can be perceived as the California Adventure for Tokyo Disneyland. However, DisneySea has more water-related themes and different attractions than California Adventure. There are few similar rides such as Twilight Zone Tower of Terror, Indiana Jones, and Midway Mania. The good thing about Tokyo DisneySea and Tokyo Disneyland (both theme parks are part of Tokyo Disney Resort) is that you can purchase your tickets online ahead of time, from home away from Japan! You just select the date you plan on visiting, print the tickets at home, then bring it to the theme park on the day of. We got our tickets for ¥6,400 (~$54 USD) per person in March, before a small price hike in April. DisneySea is surprisingly ~$30 USD cheaper than California Adventure! It took us about 30 minutes from Meguro Station in Tokyo to Maihama Station in Chiba. Then we went on the Disney Resort Line, which loops around the resort with four stops. As soon as we got inside DisneySea, we went straight to the information counter to obtain an English map of the park, then headed to Mysterious Island for some grub! There’s a large outdoor dining area at the bottom of Mysterious Island. We got a Kirin Ichiban frozen beer and smoked turkey leg from Nautilus Galley. I’ve never had a turkey leg at Great America or Disneyland, but according to my sister, they’re really salty and as big as her forearm! The turkey legs here were much smaller, like a large chicken drumstick. It was also mildly salty and went really well with beer. The frozen beer was a bit of a hassle to drink at first. The upper part was literally frozen beer foam and we had to nibble on it to make way for the beer! 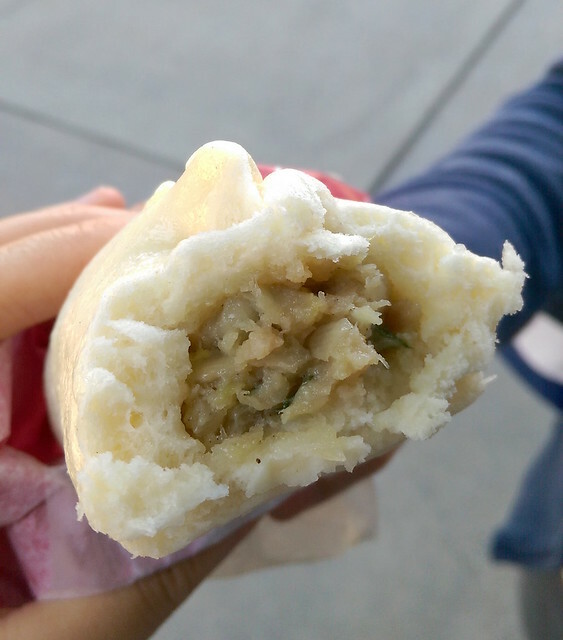 The next food stop was at a food cart selling gyoza sausage bun, in between Mysterious Island and Mermaid Lagoon. There’s always a line at this cart, so that must mean it’s not to be missed! Verdict? 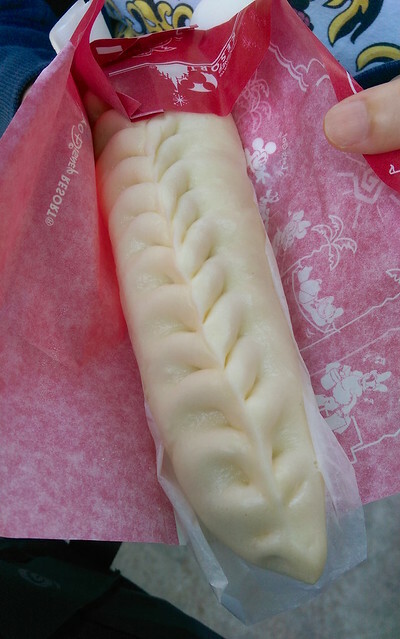 A must-get at DisneySea! It’s a very yummy pork bun in the shape of a large gyoza! We shared one and it was gone within seconds. 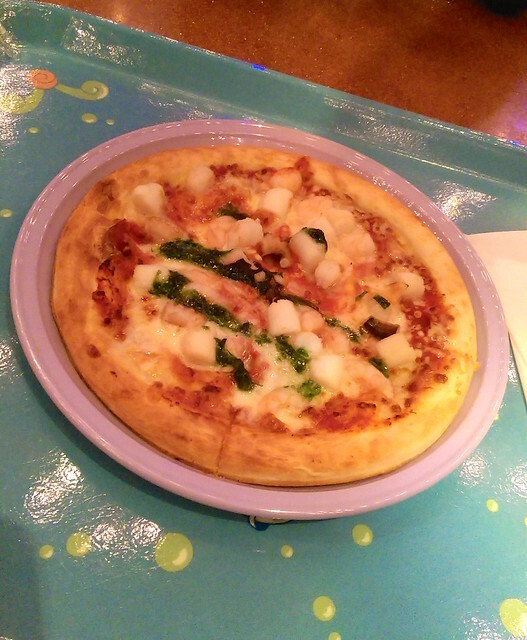 At Mermaid Lagoon, we got a seafood pizza (¥700) which had scallions and octopus. Not your typical pizza, but the seafood was delicious! 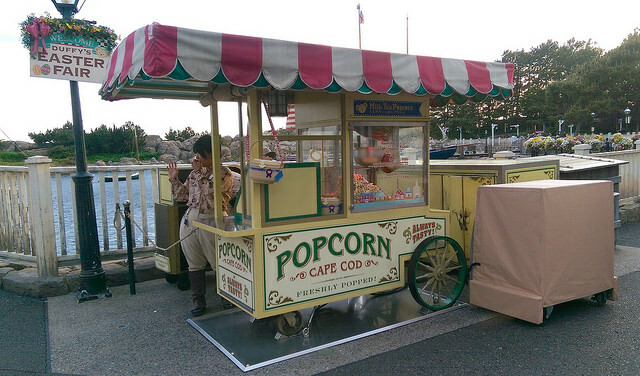 There were various popcorn stands with each one selling a different flavor, all over DisneySea. The available flavors were caramel, black pepper, jalapeno & cheese, milk tea, white chocolate, salt, curry, and cappuccino. The park map has the locations of all the flavors, if you’re popcorn hunting. There are two different ways of purchasing the popcorn. The first option was purchasing a character basket (the character is different at each location) with popcorn for ¥2,600. 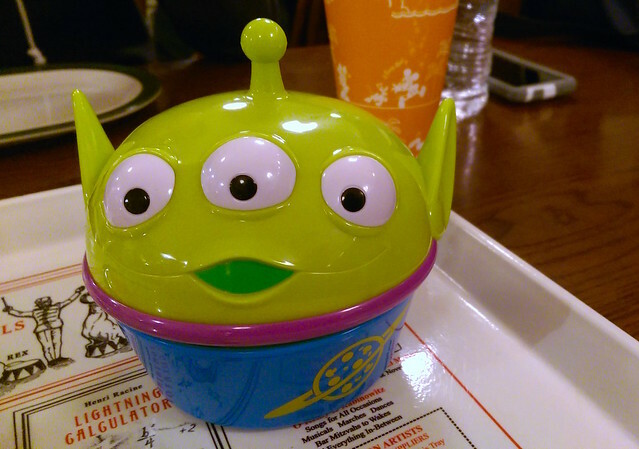 Refills for these character baskets at any location was ¥520. The second option was getting a regular paper box for ¥310. The flavor we wanted most was milk tea, which was located at Cape Cod. The popcorn was fresh and the milk tea flavor was on the lighter side, and scattered in our batch. Next, we had rice wrapped in bacon that looks like sausage. Unfortunately no pics because it was after dark and we were hangry… But I can tell you it was greasy as heck, but moist and delicious! 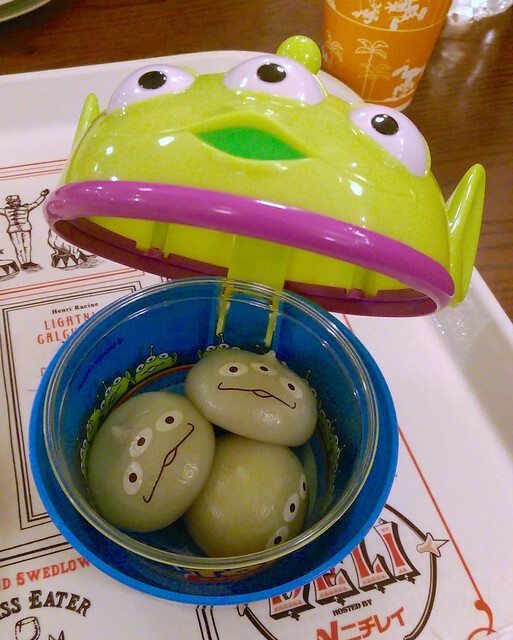 After the light water show, my cousin reminded me about the Toy Story alien mochi dumplings. We ended up asking a cast member for its location, as it was nowhere near Toy Story Midway Mania. Turns out, they’re called “Little Green Dumplings” and comes with a souviner case for ¥880, and is located at New York Deli in American Waterfront. Isn’t that adorable?! Inside were three mochi dumplings, each with a different creamy pudding filling (chocolate, strawberry, and custard). Have you been to DisneySea or Tokyo Disneyland? 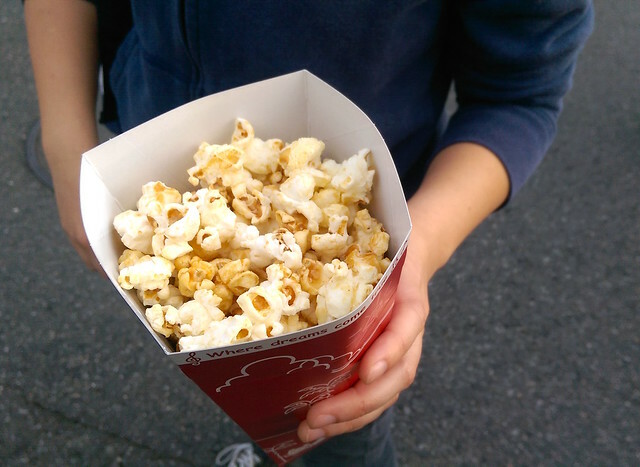 What was your favorite food and/or popcorn flavor?